A while ago, I was intriuged by a recipe in Jamie's Dinners that pairs lamb cutlets with mushrooms and cooks them in the best way on a griddle pan. I love how this dish can be ready in just 5 minutes, where the natural juices from the fresh cutlets and earthy mushrooms create such crisp and mouth-watering flavours when mixed together with such little ingredients. A chunky basil and pinenut sauce can be made to serve alongside the meat, but is not necessary. Slap the cutlets with the heel of your hand to flatten them slightly. Bash up the thyme in a mortar and pestle, and add a little olive oil. Mix together, then rub the oil over the cutlets and season both sides. Put to one side. After that, grill both sides of the mushrooms, dry, on the bars of a hot griddle pan. This may seem unusual, but it gives you a nutty flavour that you wouldn’t get otherwise. Set aside in a large bowl. 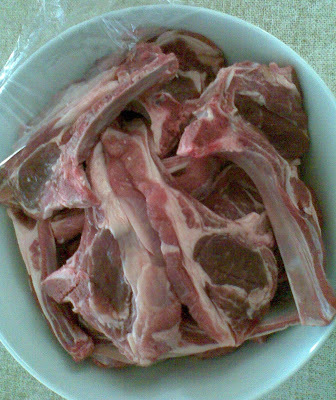 With the heat still on, place the lamb cutlets on the griddle pan and cook for 3-4 minutes on each side (for a 1.5cm thick meat to be Medium) until golden. 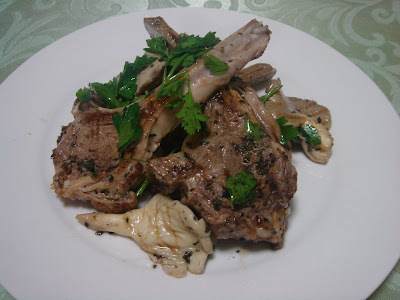 When cooked, put the lamb cutlets into the bowl with the mushrooms and drizzle with a little olive oil. Tear over the parsley, in quite large pieces, and add a good squeeze of lemon juice. Season lightly and toss around. Place to one side to rest, to allow all the lovely juices to get sucked up by the mushrooms. To make the sauce, in a mortar and pestle, pound up the pine nuts until you have a mushy pulp – this will give the sauce a creamy flavour and texture. Remove the mixture to a bowl, then add the basil to the mortar and bash to a pulp with the pestle. Add this to the pine nuts and loosen with extra virgin olive oil so that the sauce easily drops off the end of a spoon. Finally, balance it with enough balsamic vinegar to give it a good zing, almost like a mint sauce. Give the lamb and mushrooms a final toss and served on a big platter with a simple salad and the basil sauce on the side.